In September 2014 the group tied themselves to a 25ft (8 metre) high “tripod” over a railway line in Washington State, US, to block a train carrying crude oil which, if used, would have contributed directly to carbon emissions and so climate change. The activists, now known as the “Delta 5”, relied on the so-called “necessity defence” to justify their actions and avoid criminal liability. A successful “necessity defence” needs to show that the crime was necessary in order to prevent an even greater criminal act or irreparable evil. There should be no reasonable legal alternative available under the circumstances. In court, the Delta 5 argued that their actions to prevent the oil from reaching its destination were necessary to stop the greater harm of climate change. As such, they said they shouldn’t be held criminally responsible. The activists hoped to set a new precedent in the United States which would have paved the way for climate activists in the future to more readily use necessity as a defence to criminal charges. In 2008, for example, a group of six Greenpeace activists were tried in the UK for property damage and trespass after shutting down a coal power station. They used the necessity defence and were acquitted by a jury. The judge in Seattle, however, ruled that the defendants had failed to show that there was no reasonable legal alternative to their actions. Even though the judge was sympathetic to the activists cause, she was bound by case-law on the lack of evidence supporting a necessity defence and reluctantly instructed the jury to ignore all wider arguments about climate change. The five were found guilty of misdemeanour trespassing. Legal recognition for “necessity” remains a long-term goal for climate activism, but the latest setback shows how difficult these arguments are to win in court. It’s not just climate change. Attempts to justify the use of marijuana for medical purposes have been met with mixed success, where successful necessity defences have been very much the exception rather than the rule. Necessity has been most successful in cases involving potential crimes by doctors around the issue of consent, but there are major limits. It’s usually not recognised as a defence against murder charges, for example, a view that dates back to the 1880s when two shipwrecked sailors decided to kill and eat their subordinate, a cabin boy, for survival when lost at sea. Delta 5 – taking the law into their own hands. 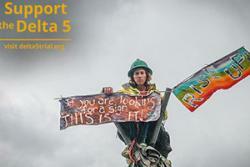 : delta5trial.orgWhile necessity is difficult to assert in climate activism trials, the Delta 5 and Greenpeace cases raise a big question: should activists be allowed to take matters into their own hands to prevent global warming and climate change? Given underwhelming results in combating this at the international level to date, arguably they should. Since the 1950s legal theorists have argued about the consequences for people who feel morally compelled to break the law. The so-called “Hart-Fuller” debate, which continues to divide legal scholars to this day, examined among other things the nature of laws in Nazi Germany – for example, was legislation which authorised the transportation of Jews to concentration camps valid law at the time? The prominent legal philosopher HLA Hart argued yes: he believed laws continue to have legal force, despite a questionable moral basis. Lon Fuller, his rival, said that laws have an inner morality, without which there is nothing to be enforced or obeyed as “law”. Fuller’s position may provide moral guidance to climate activists who perceive as immoral the legal framework currently configured to see global temperatures far exceed the 2°C limit. They can use society’s understanding of what the law ought to be – one that protects the environment – to justify their decision to disobey. Hart would say that the law should not be disobeyed despite its questionable moral basis because to do so may open the door to anarchy and conflict. However the necessity defence falls squarely within the letter of the law, and therefore Hart’s theory, though it remains notoriously difficult to prove. Climate activists should bear in mind that they will need convincing proof of no reasonable legal alternative to their actions in order to increase their chances of success when raising necessity as a defence in future criminal trials. The best way for climate activists to do this would be to leverage conventional legal and political routes as much as possible to achieve their goals. Once all of these options have been exhausted, then there may be no further reasonable legal alternatives left and as such, acts of civil disobedience which break the law may more easily be justified as being necessary. But as yet, strategies that draw upon Fuller’s theory of the inner morality of law, to justify disobeying the law regardless of reasonable legal alternatives, may not help activists keep a clean criminal record. It is quite clear that necessity isn’t a reliable defence against criminal charges at present. But more sympathetic judges and juries in the future may radically transform the odds of success. The judge in the Delta 5’s case was sympathetic, though it didn’t lead to their successfully defending their position. As the effects of climate change become more and more noticeable, perhaps there will be no reasonable legal alternative in the future but to follow in their footsteps. The law just might keep pace.